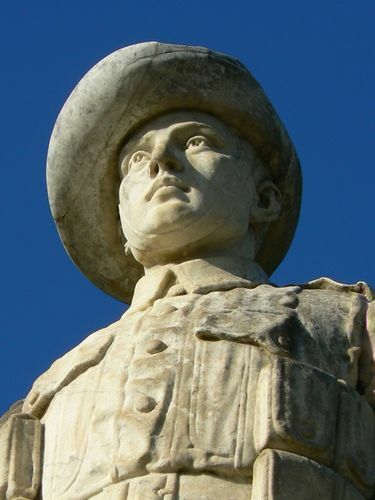 A monument commemorates the servicemen from Alphington who served in World War One. A grey obelisk with gold lettering, and on top is a marble statue of a World War One soldier. The residents of Alphington are erecting in the local park a memorial to the soldiers who enlisted from that district. In order to have a full and complete list the names of those already obtained are published in the advertising columns of "The Age" today. The secretary would be glad to obtain additional names or rectify errors. The memorial is to cost £600. The committee is arranging for the unveiling ceremony to take place during September. Age (Melbourne), 19 July 1921. On the motion of Mr. Cain, M L A , and Mr Kiernan, M L C , a vote of thanks was given to His Excellency and Lady Forster for their attendance. It was stated by the shire president (Councillor C. Hannah), who presided, that it was the first time in the history of Alphington that a Governor General had visited them. He hoped that it would not be the last. Argus (Melbourne), 26 September 1921. By His Excellency Lord Forster P.C. G.C.M.G.